Huntington Beach State Park, located across from Brookgreen Gardens in Murrells Inlet, South Carolina, is an oceanfront state park that has it all. Just minutes south of Myrtle Beach, the park has a freshwater lagoon, a salt marsh, maritime forest trails and best of all, three miles of pristine beach! Popular activities at Huntington Beach State Park include camping, fishing, picnicking, biking, swimming, hiking and some of the best bird watching on the East Coast. The park offers miles of roads for biking and miles of trails for hiking this heavily wooded area. 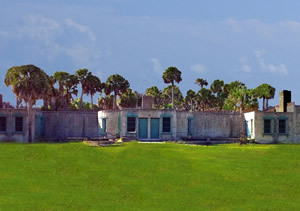 The park is home to a Moorish-style castle, the Atalaya, which was the former winter home and studio of renowned American sculptor Anna Hyatt Huntington. Listed on the National Register of Historic Places, the castle has a 40 ft tower, a studio with 25 ft skylight and 30 rooms around the castle's perimeter. Guided castles tours are available March thru October and self-guided audio tours are available year-round. Art lovers will also enjoy visiting the Atalaya Arts and Crafts Festival held in and around the castle every September. Visitors of all ages will enjoy the park's Environmental Education Center. You can pet a stingray or see loggerhead turtles and other endangered species of animals and plants up close and personal. The park's freshwater lake is a great place to see alligators in their native habitat. 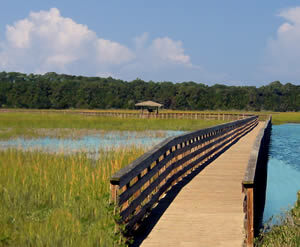 While visiting Huntington Beach State Park you are sure to see dozens of alligators and other wildlife. Take a stroll down the marsh boardwalk and you'll see fiddler crabs, egrets and loads of other birds. For a state park closer to downtown Myrtle Beach, visit the Myrtle Beach State Park. The oceanfront Myrtle Beach State Park is just minutes south of the city limits. The park is the ideal spot for fishing, swimming, camping, picnicking and much more. If you're planning at trip to Myrtle Beach, browse our selection of oceanfront hotels and condominiums conveniently located in the heart of Myrtle Beach, South Carolina. 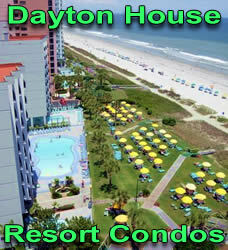 You will find great rates on some of the most luxurious, amenity-laden resorts along the Grand Strand.